More than half of all the business owners throughout the United States employ some type of security equipment in their establishment. 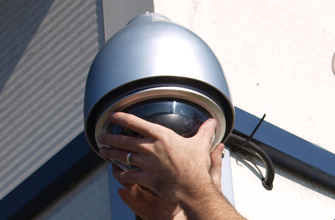 Close to half of all businesses use their cameras to help monitor their employees. From phone to computer usage, you will know exactly what your employees are doing on a continual basis. Many employees end up placing the security cameras into the workplace to help ensure quality performance in everything they do. A minimal amount of employers will end up using a GPS system to help monitor and locate their company vehicles. When you have surveillance cameras in the workplace, it tends to improve your overall performance in the workplace. Employees will tend to minimize the amount of time they spending surfing the Internet and sending emails that are not related to anything on the job. They will instead be focusing their time on performing a number of different tasks that are beneficial to the bottom line of the organization for which they work. Businesses that have a specific amount of knowledge about their business from monitoring the activity on the floor will be able to institute various practices that will help address any problem areas on the floor. For those who own their own business, it is imperative that you have security measures in place to help ensure you are not wasting money on employees who are not doing their jobs properly. It is unfair to you as the employer to spend a fortune in labor costs just because you have employees who think they can get away with it. Thanks to a security system, you will know that your employees are doing what you pay them to do and nothing less. You will be able to ensure your business practices are properly completed and maintain a sense of efficiency on the floor. If your security monitoring shows you that your workers are spending time on social media platforms, shopping online for their own personal usage or engaging in activities that do not correlate to your business, you will end up putting restrictions on those activities. Management can use filters that help to block the access of employees from a variety of different sites. Based on statistics from a number of other companies, around 65 percent of those people use filtering software on their computers in the workplace. When your employees are not able to spend their time on social media sites, you will be able to rest assured that your business policies are being adhered to and productivity is at its peak. Business owners are able to protect all of the assets of their business through security cameras around the business floor. It could be something as minor as an employee taking a box of paper clips and placing them into their pocket or purse. There is also the likelihood that an employee is selling information about your company to the competition. Incidents like these are exactly why you need a security camera in place to help protect your business from theft on any level. You won’t have to worry about the assets of your company being compromised because of inadequate surveillance footage to prove your claim. In the event any employee does happen to violate your company policies by stealing or selling information about your business, you will be able to prosecute them to the fullest extent of the law. Thanks to the advancing technology in today’s market, anything from an email or incriminating memo sent by an employee form the office computer that could be recovered to help prove their wrongdoing. Regardless of whether the employee deleted the files or not, you will have the evidence you need to prosecute the perpetrator. More than 80 percent of all business owners who are using surveillance cameras will let their employees know they are being monitored while on the computers. Close to 80 percent of all businesses have anti-theft security systems installed in their business, while around 90 percent are monitoring their employees through video feed. Even though it may seem foolish to tell employees they are being monitored, it is actually one of the best things you can do to help protect your business. You are actually giving your employees a way to take on more responsibility and be a lot more productive than what they would be if they were not being monitored. Knowing that the boss is watching them at all times helps employees create a sense of pride and responsibility in their overall job performance. You will not have to worry about confronting your employees all the time because of a decline in their business performance. Instead, your employees will always be on their best behavior and working hard to provide you with the level of productivity you desire on the job. If your business lacks consistent regulations in the workplace, it can create a wealth of legal issues for you, especially when trying to monitor your employees. Even though there are not a lot of regulations for monitoring your employees in the workplace, there are certain states that have laws in effect for monitoring workers on the floor. It is imperative that you understand the rules and regulations for your state to help prevent any potential lawsuits down the line. You need to understand the rights and responsibilities of you as a business owner, as well as the rights of your employees. If your security system were not properly working, a number of different things would have been missed in the downtime. You could end up with employees stealing from you while on the floor, productivity levels being at an all time low with no explanation and waster labor costs on employees who are surfing the Internet. Make sure your business security system is properly working at all times to help keep your bottom line intact. Contact us today for further questions, we will be happy to assist you.